Several of you have inquired about Jasmine. I appreciate that and have some amazing news to tell you. For those who don't read my blog regularly, Jasmine gave birth to a stillborn doeling on May 8th. In addition to it being a difficult labor, the right half of her udder became rock hard immediately after kidding. I could not express any milk from it, so I was very concerned about pressure buildup as she continued to produce milk. It would be not only painful for her, but the vet told me they'd seen ruptured udders in the past. I decided I had no option but to dry her up as quickly as possible. Toward that end, I searched online for herbs to dry up milk supply. There was a lot of information for humans, but I figured they would work for Jasmine as well. One herb reputed to help is sage, which I grow in my herb garden. I started trying to feed her that. 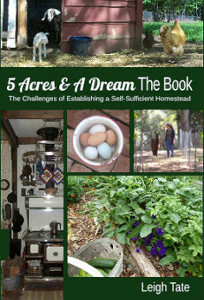 As I continued my research, I ran across an article entitled "Herbs, Milking and Mastitis, Five Secrets." I had already give Jasmine's the vet's prescription antibiotics for mastitis, which hadn't helped at all. Having only a nominal faith in pharmaceuticals anyway, I was willing to give herbs a try. Three of the four herbs mentioned to treat mastitis, were ones that I have growing here: poke root, comfrey leaves, and calendula flowers. It was easiest for me to make a salve, so I pulverized these in the blender with vegetable oil. I admit I didn't measure. I just dug a big chunk of poke root, grabbed a big handful of comfrey, and the few calendula flowers that I had in bloom. Once I had a slimey green goop, I added melted beeswax, following the same procedure I showed you here. I ended up with a pint of salve, which I have been massaging this on her udder three times a day. I noticed no difference for the first several days. It was also during this time that I realized that side of her udder wasn't swelling with milk. I was greatly relieved at this, and since she didn't care for the sage anyway, stopped giving her that and continued milking out the good side twice a day. Within a few days the mass in her udder was noticeably smaller. It's been three weeks now, and we've gone from a rock hard melon sized mass, to a tangerine size softer (but still palpable) lump. She absolutely loves have her udder massaged. In fact she'll bow our her legs and let me rub and massage for as long as I want. In addition to that, I've been feeding her about half a dozen stalks of comfrey daily. She'd eat more if I had it, but I have to ration according to the number of comfrey plants I have to keep a steady supply going. Herbalists use poke root to treat problems with the lymphatic system, skin problems, tumors of the mammary glands, and specifically mastitis. Comfrey is used for skin conditions, sprains, bruises, ulcers, burns, and swelling. Calendula is applied to cuts, scrapes, rashes, and inflammation. The one recommended herb I don't have is red clover. It is traditionally used for cancers, skin conditions, and breast discomfort. We've had a few red clovers pop up here and there, but I really should plant some for future use, pasture and hay at the very least. She's not cured yet, though I am obviously very hopeful. Until then, her future remains questionable, but for now, she is a good companion for Surprise. As with everything else in life, we're just taking it one day at a time. I approached my strawberry jam making a little differently this year. In the past I've always had to purchase strawberries, but this year we had our own. In spite of being transplanted early in the spring, they made a good showing of berries, for which I was grateful. I was concerned however, because no one picking ever yielded enough for a batch of strawberry jam. I use the low sugar recipe on the no sugar pectin box. This calls for 4 cups of mashed berries and one cup of white grape juice (I use 5 cups mashed berries). It yields 6 or so half-pints. We eat so much strawberry jam however, that I usually put it up in pints, making at least two batches back to back to get a canner load. That meant I would need 10 cups of mashed berries per canning session. My individual pickings didn't come close to that, (of course we were eating our fill), so I decided to freeze them to save up enough for jam. Ordinarily I wouldn't be too keen on making jam from frozen berries, but it was either that or having to buy them. I'd rather make them from our own. I let all the frozen berries defrost the other day, and not only did I have enough for a canner load of pints, but I had 4 cups of strawberries leftover, just one cup shy of a third batch. In the past, six pints of jam wouldn't be enough to last the year, but last summer I canned blueberry jam for the first time. DH declared this equal to his beloved strawberry, so we've been alternating between the two. In fact, I still have a few jars left from last year. This year's on top of that ought to be plenty, especially if I can more blueberry jam. Speaking of blueberry jam, now I'm wondering if perhaps I should make it from last year's frozen blueberries. We've been enjoying them in muffins and pancakes, so I'll have to count and see how many quarts I have left. There should be enough for a couple batches of jam. Then I'll freeze a fresh batch from this year's pickings, plus make more pie filling. I have another theory. This one has nothing to do with egg laying myths like the last one, but as you've probably already guessed, it has something to do with immunities and milk. Of course, this in itself isn't a theory I can lay claim too. The fact that immunities are passed on to the baby through it's mother's milk is well known. So based on that, here's what I've been observing and the conclusion I've come to. Observation #1 - Goats eat poison ivy. This is good since we have a lot of poison ivy around the place. The property was neglected for a number of years so when we bought it, poison ivy was a well established vine growing in the yard, in the fields, and up many of the trees, where it would flower and sprinkle seeds all over the ground. One of the reasons we got brush goats first, was to help us deal with the poison ivy (and kudzu). Observation #2 - For the first two summers, Dan and I were constantly battling nasty rashes from poison ivy. Dan especially, who seems to get it just by looking at it. I have seen him so bad, that his eyes were swollen shut. I get off easier, actually having only developed an allergy to it in recent years. Observation #3 - Now that our goats have freshened, we are consuming goats milk, in our coffee, on cereal, as yogurt, as whipped cream, as yogurt cheese, and as whey. Observation #4 - Even though we're still in contact with poison ivy, our cases this summer have been extremely mild and quick to heal. Do you get where I'm going with this? Conclusion (my theory) - That we have developed an amazingly increased immunity to poison ivy by consuming milk from goats who eat it. IOW, they are passing on an immunity in their milk. If you do an internet search on "eating poison ivy for immunity," you'll find the full gamut of responses. Everything from "it works for me, I do it every year," to "it's dangerous, you'll die of anaphylactic shock". I've never tried eating it and couldn't convince DH to. What I can tell you is that consuming milk from a poison ivy eating goat appears to have increased our immunity to it! This is probably one theory that I won't be able unofficially research (volunteer anyone?) All I can say is, I believe it and it's a welcome added value to our goats milk. the corral panel is the spot for the new goat shed. 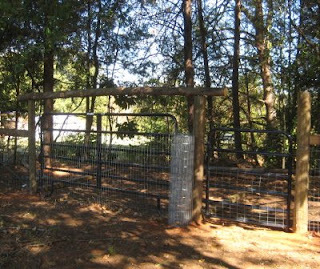 After we finished fencing the pasture last October, we decided we needed it needed it's own goat shed. We knew we'd eventually keep several groups of goats, and need to keep them separate. 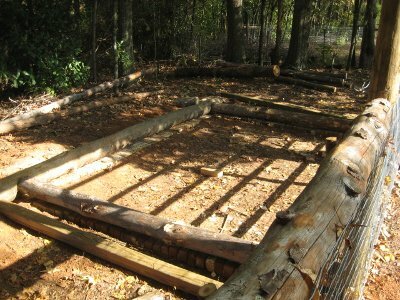 Dan started on it last autumn, building at the back of the pasture. 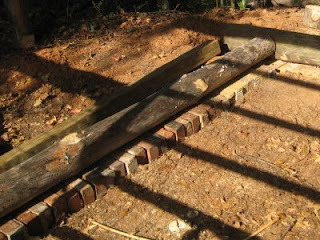 He used materials we had on hand, including old bricks and falling over pine trees. .... and then, when the weather got wintry, turned his attention to working on the house. 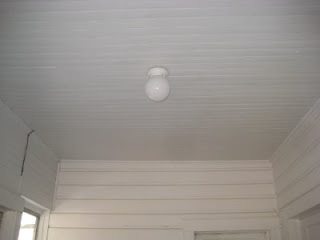 We finished the second bathroom, got started on the kitchen, and worked on the back porch. Once we put a deposit on the two Pygmy bucks however, we knew this project needed to get done ASAP. He worked on getting three sides done with windows, and then started on the roof. The roof was the only thing for which we had to buy was materials. The metal roofing we found 2nd hand, but the wood for framing had to be purchased new. Scraps of welded wire fencing over the windows are as much to keep unwanted critters out as it is to keep goats in. In the winter, we will cover them to keep out wind and rain. It's not complete yet, but it's serviceable for the summer. It doesn't have to be air tight, but it does have to protect them from wind and wet. Before next winter we will add a fourth wall in front and a gate. The gate probably isn't necessary, but I like to be able to secure them for whatever reason. Gaps between the logs will need to be chinked. We also want to make sure the drainage is adequate as well, because we don't want our goats having to live in mud. It looks kind of neat and was fun to build. The materials were mostly free, but the project made Dan wonder if this was really the best way to approach it, because what we save in money, we spend in time and energy. 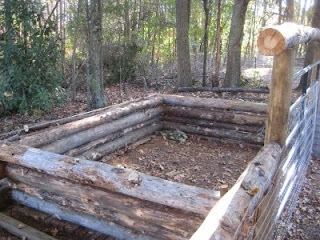 Working with logs is a real challenge, especially in terms of getting everything plumb, level, and square. They actually don't share very well. As excited as we were to get started on the kitchen, we're also excited about our goats. Our animals needs always take priority. Plus, there's just something about being outdoors that makes me not want to go indoors. As with everything else, it's one step at a time. My garden is coming along slowly. Everything got planted late because of our April rains, so things are still in the beginnings of emerging. May has brought a lot of rain to the Southeast, but not here. Not to our county. Every day is at least partly overcast and the forecast is always for rain, but we haven't been getting more than a sprinkle here or there. The deeper soil is still holding moisture, but the surface soil is dry. Consequently I have lots of seeds needing moisture! Most of my terraces look like the photo above, plants sprouting but not tall enough to be mulched yet. Everything seems lost in the leaf mulch! Both beds contain fingerling salad potatoes. I planted Red Pontiacs too, but much later for keeping. The bed on top also contains cabbage plants and marigolds. The cabbages may be a loss because something has eaten out their slow-to-develop centers quite thoroughly. The potatoes in the lower bed share it with cowpeas and petunias. The cowpeas I'm planning to try for chicken feed, as one of our goals is to feed our animals as well as ourselves. The petunias are supposed to repel Mexican bean beetles, so that's why I planted them there. They are also supposed to repel cabbage worms, so perhaps I planted them in the wrong bed! To mulch, I used the leaves I collected last fall. Some layers of leaves had gotten rained on and these were beginning to decompose in the pile. They made bands of lovely black compost. Next year I'll be sure to wet the layers of leaves as I rake and add them, to promote this. My indoor started Roma tomato plants look good so far, and a few are even sporting flowers. In between those, I'm waiting on Ruby Chard, cinnamon basil, calendula, and flat leafed parsley. The parsley looks like a no-go however. One thing we've been enjoying has been our English peas. I planted Wando, which tolerate heat fairly well. This is good because it seems that we always go from chilly to hot weather all too quickly. The other night we enjoyed a pea and pecan salad! Yummy. The pecans were from our trees of course. I've already shown you some of the things I've been doing with our strawberries. Actually I'm amazed that they did so well, considering I had to transplant them in March. There were some expected bird pecks, but also some unexpected black beetles burrowing their way through some of the berries bite by bite. We got fresh berries from about mid-April through mid-May. Some plants are everbearers though, so we should get more on occasion throughout the summer. The fall garden (pink beds) is a weedy mess! I've been too busy making terraced beds to do anything about that. 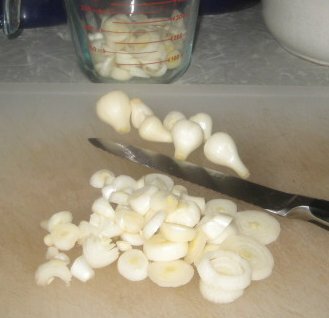 It's mostly harvested except the garlic. The lettuces, radishes, carrots, beets, broccoli, and turnips I'm allowing to go for seed saving. ...our winter wheat. It is beginning to turn yellow. It can be harvested when the berries are no longer soft and doughy to taste, but firm and crunchy. The other thing is our field corn! There are some bare spots but germination has been pretty good. We planted half of it last month, and the other half yesterday, for a total of 5 pounds seed. This is an arbitrary amount, intended as a starting point. It will give us a good idea of how much we need to plant next year. I'm going to plant some pole beans and pumpkins in there soon. In the rest of the plot, I'm going to plant black oil seed sunflowers, also for feed. That's the gardening update for our little corner of the world. How is your garden doing in yours? I never dreamed I'd have whipped cream from our goats milk. But I did, and we had just enough for our first picking of strawberries. Can you say "Strawberry Shortcake"? You may recall that originally, Surprise's twins would only nurse from one side. I milked out the other side and it was from that milk that I got our first cream. I discovered that while there wasn't a lot, it separated easily, and was thick, almost solid. In fact, I was able to scoop it off with a slotted spoon. I saved it up until I had enough to whip, which it did beautifully. This particular cheesecake turned out a bit soft because I didn't let the yogurt cheese drain long enough (can you say "impatient"?) That didn't make it any less tasty though. They are registered Pygmy bucks, the second half of our Kinder starter kit. 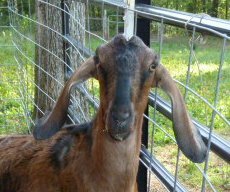 The Kinder is a Nubian / Pygmy cross, mid-size, dual purpose goat (for both milk and meat), perfect for homesteaders. To this cross the Pygmy contributes its small size; excellent feed conversion (high milk production on minimum food intake); high quality, high protein, high butterfat milk; heavier mucsling (for meat production); breed hardiness; aseasonal breeding (i.e. year around); and multiple births (triplets and quads are common). 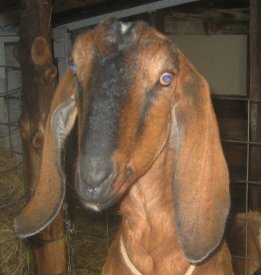 The Nubian contributes longer legs (better for standing over the milking bucket); larger, easier to milk teats; a well attached udder; higher production of high quality milk; extended lactations; more correct rump and rear legs; adorable "airplane" (long and somewhat lowered) ears; and color. "McGruff," scratching his head & back on the pick-up. Rescue Me, well, we're not going to call him that. Nor "Rescue." Actually we've started calling him "Gruffy," "Ol' Gruff", or "McGruff". He's 4 and 1/2 years old, and stands 18 inches tall at the withers. Standing next to Dan's Chevy S-10 pick-up, you can see he's not very tall! His coloring is referred to as caramel, which is one of the six Pygmy colorations recognized by the National Pygmy Goat Association. Chipper, a grey agouti, is 10 weeks old and smaller than Surprise's 3 week old twins. That may seem young, but unfortunately for little bucks, they are commonly separated from their mothers at about 8 weeks of age. This is because they are fully capable of breeding at 2 months old. He has some growing to do before we promote him to that role. I got the bucks now because they were available. 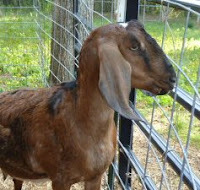 Last summer, I started looking for a registered Pygmy buck too late, and couldn't find one of breeding size for sale. I had to resort to Breeding Plan E, which at least meant kids and milk for this year. The very day we decided to continue looking for Pygmy bucks, I found a breeder on Craigslist. He had several available and gave us a deal for buying two. We thought two unrelated bucks and two unrelated does was the best way to start our Kinder herd, giving us a larger genetic pool for the first several years. McGruff has been polite and willing to receive a scratch on the head. He'd prefer to go home, if you please and thank you very much, but hasn't ruled us out altogether. His bleating is so funny. He sounds nothing like a goat, and everything like the "gruff" in 3 Billy Goats Gruff (hence his new nickname). Chipper's bleating sounds more like the "beep, beep" of a toy car. We're hearing a lot of it because he misses his mom! By day two, he was hoarse, but that didn't stop him. Actually he'd much prefer being in with the twins and the does. In fact, he made his great escape in the (now blocked) gap between the gate and the gate post. Once he got in with the girls, however, no one seemed to be very interested in his plight. Much to his dismay, they all ran away. He didn't let us actually catch him, but did allow himself to be herded back through the gate. Pygmies are really neat goats and very personable. I see why folks fall in love with them. Hopefully they'll make their adjustment quickly and be content with their new home. It was inside my closet. 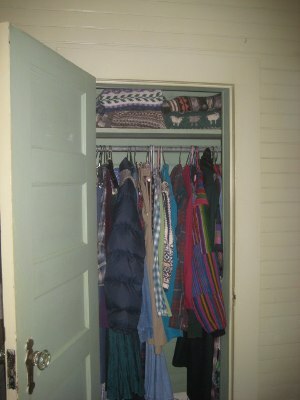 Now, consider that the ceiling in this closet is almost 9 feet high. Consider that the closet width is barely 2 feet. That the shelf and clothing rod have to be removed in order to get a ladder in there. That the ladder barely fits anyway. Do ya reckon this one qualifies for a "what in the world were they thinking" award? At that time, we were working on tearing down the old chimney, and installing chimney pipe for the soapstone woodstove. I didn't really feel like taking all my clothes, rod, and shelf out of the closet every morning so we could work in the attic. Nor was it easy to haul tools and heavy chimney pipe up that way. 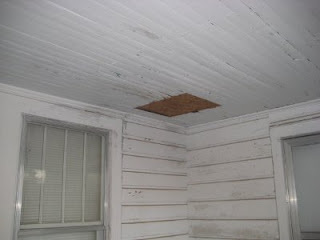 We finally opted for the field expedient method, and cut a rude opening in the front porch ceiling. This ceiling is a disaster anyway and will have to be replaced when we do the front porch, so what's one more big ugly hole? 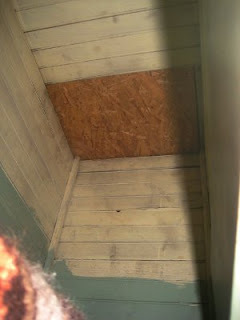 At least it was close to the part of the attic we needed to work in. Of course, this is at the front of the house. Now we need to work in the attic area above the kitchen, at the rear of the house (floor plan here.) Not only will we need to haul more chimney pipe into the attic for the wood cookstove, but also materials so that we can remove that stupid post in the middle of the kitchen. All of this was leading up to the decision to install proper attic access. In some ways we were reluctant, because after the detour with the back porch, we've been anxious to get on with the kitchen project. But really, Dan needs to be able to get up there for that, and in the long run we'll be glad we did it. Where to put it? We decided that the back porch ceiling would be the most logical location. Now we have a foldable aluminum ladder, just a cord pull away. I'd also like to put down a sheet or two of plywood on top of the ceiling joists for a little bit of attic storage space as well. Up next? Well, we're on a slight goat detour at the moment (more on that soon), but the next project on the house will be the electrical work and moving the service panel. For that I need to have my lights, switches, and outlets figured out for the kitchen, (also neglected due to kidding and garden). Funny how summer has a way of shifting our project focus, but we plan to get back on track with the kitchen soon. Well, here's what's going on with Jasmine. After her difficult labor and delivery Sunday, I decided Monday morning to take her to the vet. I was still uncertain about the placenta, plus the right side of her udder was very hard. (This is the side she had problems with previously.) I also decided to take her to someone who specializes in larger animals and runiments. My local vet is excellent for routine things, but for this, I wanted to take her to someone who was best set up to help her. The specialist is located in another part of the state so it meant quite a drive, but this was our best option. I had started Jasmine on penicillin injections at home, but her temperature at the vet's was 104.4, (normal varies with the source, but usually 102 to 104 F is normal). The vet examined her and said she was developing a uterine infection, which is not uncommon under the circumstances. She flushed her out, and gave her several injections: nuflor for the infection, banamine for the fever and swelling, and lutalyse to help her expel anything that might be left in the uterus. I was also given two doses of pirsue for the mastitis. We went back on Tuesday, for a second uterine flush. I'm to take her temp at home on Thursday, and call it in. I will probably need to take her back then for a second dose of antibiotic. Jasmine's appetite has been fair, so at least she has been eating and drinking. I've added probiotics to her diet because of the antibiotic, and also blackstrap molasses to her drinking water to make sure she's getting lots of fluids. Emotionally, she's been loud and clingy, hollering pathetically unless I'm around and she can have body contact. She actually has a fairly mellow personality for a Nubian, so this is very unlike her. I'm sure there are several reasons for this behavior, including discomfort from the right side of her udder. I cannot milk it out, and it is hard and I'm sure uncomfortable. 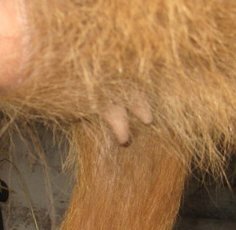 Even though the teat was saved from the previous time, the condition of the udder is worrisome, especially since this is the side she had problems with before. So that's where things are at the moment; not as good as I might wish, but not as bad as it could be. Last Monday, I asked current and former chicken owners to comment on their experiences with egg production. 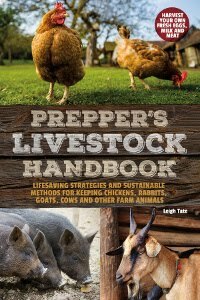 I was curious, because the how-to books I read on chickens led me to believe that chickens 1) stop laying when daylight hours get short, and 2) lay best their first year, after which egg production drops drastically. That hadn't been my experience however, and I wondered if the same was true for others. I had 25 folks offer information to help with this unofficial study. 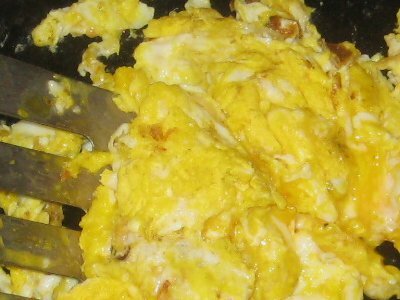 The results were very interesting, and quite positive for those of us who keep chickens for their eggs. Are they hybrid or heritage? How did your first and second year egg production compare for each breed? Did you light your coop artificially during winter's short days? Fortunately, many of you volunteered information that I didn't ask about, i.e. diet and free ranging. Egg Production after the 1st year: The majority of participants reported little if any drop in egg production after the first year. 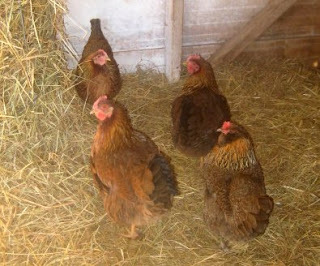 To my happy surprise, many reported that egg laying remained strong and steady with 3 and 4 year old hens. Egg Production during short, winter days: Almost everyone reported decreased egg production at various times, but this was usually associated with moulting rather than daylight hours. Spring chicks normally moult during winter months, so this may be the reason for the short daylight concept. Most of you did not offer artificial light during winter months. Some did, but just as often as not, these were in colder climes, where the purpose was for warmth. Diet: I did not think to ask about this, but many volunteered this information anyway, for which I'm grateful. Conclusion: My hypothesis was incorrect. Breed (heritage or hybrid) is not as big a factor as I assumed. The key in this limited sampling seems to be lifestyle and diet. 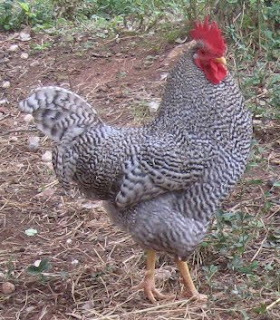 A large percentage of participants mentioned they allow their birds to free range. This not only translates into a more natural diet, but also less stress because the chickens are allowed to be chickens and do what chickens do. Diet and free ranging could be an interesting next step in this kind of research, but I'll leave that for someone else. This little study served my purposes, and I hope it's encouraging to others as well. Thank you to all who participated! We've made a first step in dispelling some myths about chickens and egg laying. Good news for homesteaders and backyard chicken lovers. Click button for more or to participate! It is with great sadness that I have to tell you that Jasmine gave birth to a stillborn doeling just before first light this morning. I had kept her in her stall most of yesterday, because I was suspicious that her time was very near. I went to check on her a little after 3:30 AM, and discovered that she was in the second stage of labor. Everything seemed to be going normally at first, but after awhile I began to worry that it was taking too long. I reviewed my books, and then went to investigate what the problem was. It was a tail first presentation (frank breech), which meant the best I could do was to try to find the hind legs and guide them feet first into the birth canal. This I was able to do, but even then, labor seemed to take forever. In the end, the baby was stillborn; likely due to compression of the umbilical cord, which cut off oxygen. As near as I can tell, this was a single. Jasmine is up on her feet and eating breakfast, but we're still waiting for her to deliver the placenta. I'm just thankful she's okay, though the event makes for a very sad Mother's Day. About a year ago, I blogged about wild onions. I had harvested some, and preserved them in what I call a "fresh pickle," i.e. just peel and pop into leftover pickle juice. The vinegar in the juice preserves them and I confess that I have a terrible time throwing pickle juice away once the pickles are eaten! Well, we've eaten a few. But since we're not especially crazy about hot foods, they're still sitting in the fridge, and will likely stay that way. Why? Because they're not just hot, they're really, really hot. And that's putting it mildly. Cooked, they aren't as hot as raw (or fresh pickled). As we enjoyed the eggs, I was reminded that they are really tasty this way. I decided to try something different this year. I decided to collect as many as I could and dehydrate them. 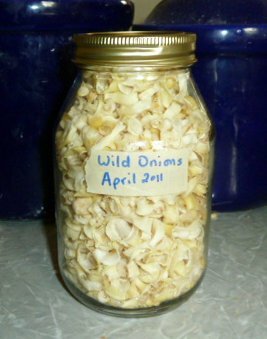 So far, I've got a quart jar stuffed full of them, and am working on a few more. Even dehydrated they are still hot, but added to soups and stews, I can adjust the amount according to taste. This is free food, which I can't bear to pass up! Dehydrating is a really good way to preserve them. We do love onions, so I doubt we can ever have too many in storage. They'll be one more thing that will be very handy to have around. I hope. 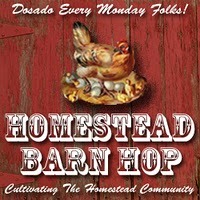 So how are our newest homestead babies doing? Come see for yourself. CryBaby, being a Nubian/Boer cross, wasn't eligible for that. She had a good personality so I might have kept her for a milk goat, except for one flaw; she was double teated on both sides. This is probably from her Boer heritage, where double teats don't disqualify from the breed standard. For a dairy doe however, they are undesirable, though all four teats were connected to milk glands. One thing that has been interesting to me has been the difference in mothering styles between CryBaby and Surprise. CryBaby didn't like being separated from her kid, so consequently he followed her everywhere. Surprise, on the other hand, tends to "hide" her kids behind the hay feeder in the goat shed. She then comes back periodically to feed them. At first I thought she was "forgetting" about them (bad mommy? ), but when I coaxed them out to her in the pasture, she ran over very concerned (good mommy), nursed them, put them back in the shed, and went out on her own again. After a couple of unsuccessful tries to get them out, I realized that she was not comfortable with them out there. When they were about a week old, Surprise started bringing her babies out, as long as the next door neighbors weren't outside with their dogs. B however, can only take so much. When children and dogs come out, baby goats would go in. Soon however, they were following her around all over the pasture, and she was finally comfortable with that. Even though baby goats are still interested! Other than that, the only other item of possible interest is that the twins tend to want to nurse only on one side. This leaves Surprise with an uncomfortable, milk swollen teat on the other side. She's a first freshener, so she's not used to being milked, nor has she quite figured out that nursing/milking relieves the pressure and discomfort. I've been milking it to help with this, and the kids are starting to nurse some on that side. It's given us a taste of Surprise's milk, which is sweet and creamy. When the kids are two weeks old and able to eat a little on their own, I'll start separating them from Surprise at night, and milk her in the morning. Jasmine is quite tolerant of them and patient, as are the chickens. CryBaby wasn't, but of course she had her own kid to be concerned about. The kids are very friendly. In fact, I'm puzzled by the claim that only bottle raised kids are friendly. It's just been a matter of spending time with them every day. They are naturally curious, and want to come see who you are and what you're about. I'm still uncertain about Jasmine's condition. Sometimes I'm positive she's pregnant, at other times, I'm convinced she's not. We'll just have to wait and see. I seem to say it a lot, "wait and see." Yet that's how it is with the "slow life" as some like to call it. Even though we wanted and chose this kind of life, human nature is still impatient. I admit to being impatient about a lot of things as well. Still, it isn't difficult to remind myself to take my time and enjoy each moment, each event. I plan to sell these two, along with Jasmine's if she is indeed expecting. All proceeds will go to my Pygmy buck fund. Ideally I'd like to get two from completely different blood lines. That would give us a good start for our own line of Kinders.